It was the first of the six stained glass windows to be installed in the sanctuary of Windsor Park United Church. I want to begin this very special time with some important introductions: Derek, Jody and Scott Read, Helen Ryane, Jim Eggie, Stuart Eggie, Mary Nurse. They have come today to give a gift to our church that we will all enjoy every time we are in this sanctuary. It is a gift in memory of someone they loved very much—Isabel Read, who was a wife, mother, sister, nurse, good friend and dedicated member of this church. She died earlier this year and we all miss her very much. I remember lots of qualities about Isabel—she had a great sense of fun, she would try anything from Thai cooking to learning the violin, and she radiated a spirituality that was strong yet gentle. Jesus offered this advice to the crowd gathered around him: Matthew 6: 20-23 “Stockpile treasure in heaven, where it’s safe from moth and rust and burglars. It’s obvious, isn’t it? The place where your treasure is, is the place you will most want to be, and end up being. Your eyes are windows into your body. If you open your eyes wide in wonder and belief, your body fills up with light.” We closed Isabel’s memorial service with the joyous hymn, Shine Jesus Shine. It was a song of faith that she loved for its energy and hope. This window will reflect that same light of hope and faith for all of us as a treasured gift. 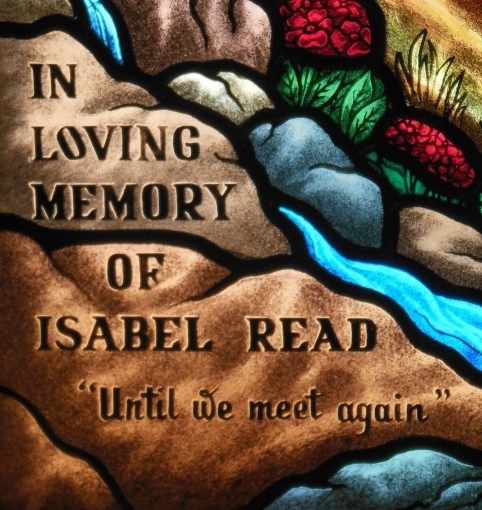 “This window is in memory of Isabel Read, who was a devoted member of Windsor Park United Church from 1979 until her passing in 2004. 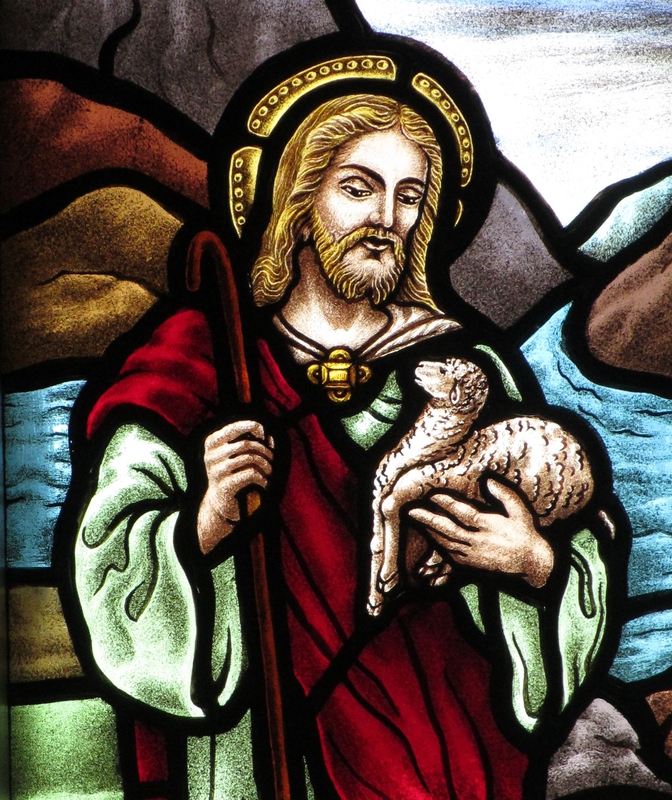 Our inspiration for the design of this window was Psalm 23 and the window is titled “The Lord Is My Shepherd”. The primary figure is a depiction of Jesus holding a lamb. 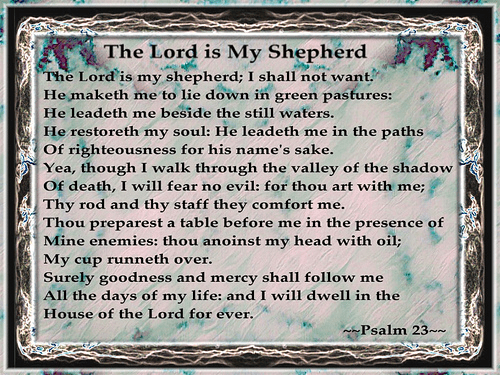 Psalm 23 was a favorite of Isabel’s. I still remember the day when Isabel was first diagnosed. That evening, when we could not sleep, we read Psalm 23 – which I am not sure if we ever managed to get through it all without breaking down into tears. As time went on, we learned to rely on the 23rd Psalm. Such as when visiting the doctor and waiting in his office for news. Hoping for the best but fearing the worst. We would rely on the strength, sincerity and the solace that you get from the 23rd Psalm, to carry us through those difficult times. I’m drawn to the final verse of the 23rd Psalm, “Surely goodness and mercy shall follow me all the days of my life and I will dwell in the house of the Lord forever”. The last time we read this Psalm was in the early hours of March 9, 2004. Helen, Jody, Scott, Jim and I were with Isabel and as we read, I hoped with all my heart that those words managed to get through in some subconscious way, to Isabel. I know she would have appreciated it. At the bottom left hand corner, we have “In Loving Memory of Isabel Read”. There are more words below that come directly from Isabel which I would like to tell you about. Just before Christmas 2003, we had a family portrait taken. From that, the photographer managed to produce a number of individual portraits of Isabel. It was her wish to give one to each family member. She wanted to address and write on each one. When it was time to do this, she was having difficulty focusing and slept a lot. She however did manage to address and sign all of them. I left the picture for me until last. I can remember her sitting on the side of the bed and it was as if a cloud lifted from her head. She wrote a personal message on my picture and she finished it up with the words, “Until We Meet Again”. I thought how appropriate to include Isabel’s own words on HER stained glass window. I’m going to finish up this morning with a Native American Prayer…..
One: Let us call upon God’s Spirit to be present as we dedicate this window. All: O God, accept our praise as we dedicate this window to your glory. One: As a congregation, we recognize the life of Isabel Read, a sheep of God’s fold and a member of our church family. All: With grateful hearts we accept this gift. One: May this window shine forth on us and give light to our shadowed souls and focus for our vision. All: This window draws us to the comfort and care of God. One: Let us be always united in faith and eager to serve the One who loves us now and forever. Knowing all that is, and is not. And the destiny of what is still to be. And all the rest remains to cherish. Your essence in all heavenly things.